Bubby and Bean ::: Living Creatively: Want to Be on Bubby and Bean? Now Accepting May Sponsors! Want to Be on Bubby and Bean? Now Accepting May Sponsors! 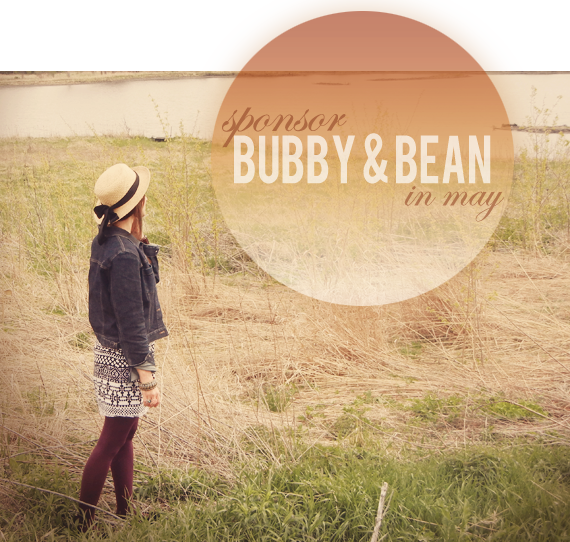 This is the official call for May Sponsors here at Bubby & Bean: Living Creatively! May is going to full of DIY tutorials, style posts, music and travel, spring/summer home and fashion projects, blogging and business tips, and lots of other goodness. And you can be a part of it through a Bubby and Bean Sponsorship! For more information on our various advertising packages and pricing, visit our sponsor page. You you can also book your ad space there directly in one click. BLOG >> In the past month, Bubby & Bean received 70,850 page views. We average 2,600 views each day, and currently have 3,610+ subscribers via GFC/Bloglovin'/readers. TWITTER >> We tweet several times a day to our 5,050+ followers on Twitter about new Bubby & Bean content with links to this site. FACEBOOK >> Our combined Mountains of the Moon page and Bubby & Bean Art page have 4,540+ fans/likes. The Bubby and Bean Blog is linked on both of these pages, and we post daily status updates with links to this blog. NEWSLETTER >> The email list for the Mountains of the Moon/Bubby & Bean Newsletter has over 11,000 subscribers. Monthly e-newsletters are sent to these subscribers with direct links to this blog. I'd be thrilled to help you promote your blog, small business, Etsy shop, vintage store, band, online portfolio, or website in May! For more info on ad sizing, pricing, stats and press, or to book your space, stop by our Sponsor Page, right here. Please note that many of our May spots have sold in advance. Remaining spots are first come, first serve. Have questions? Feel free to contact me.